You are currently browsing the The Pet Product Guru blog archives for the day Monday, September 3rd, 2018. Only a very rare dog will turn down a delicious, juicy table scrap but should you really feed your dog things that you can’t eat? 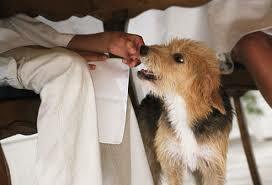 Lets consider some of the problems with feeding your dog table scraps. You may say that you’ll watch for bones right? Well maybe. Lots of small bones can get mixed into table scraps. You’ll also watch for things that dogs can’t eat like chocolate. You may know this but does a friend that might be coming for dinner? If you do feed your dog table scraps, they should be a small, measured amount along with a balanced diet of regular dog food. It all adds up and you don’t want an overweight dog begging at the table. If given sparingly, a nutritious table scrap every now and then is probably OK, it could even be a reward in your training routine. Sit, stay, good dog and enjoy that great tasting piece of chicken!